Poster, designed by Peter Saville and Phill Pennington at Peter Saville Associates. The poster was issued to commemorate Alan Erasmus's abortive attempt to recruit Russian classical musicians to the label. 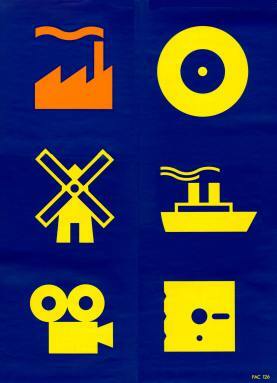 In 2008, Phill Pennington told Cerysmatic Factory "I designed the Factory logo which is simple factory symbol, initially with five other symbols for a poster to be used by Alan Erasmus in Moscow (FAC 126). My approach to designing the symbols was inspired by the well known Isotype system designed by Otto Neurath and Gerd Arntz in the 1920s. The factory symbol went through several variations as I tried different proportions different numbers of roofs, windows, waves in the smoke and so on before arriving at what seemed to be the most minimal version possible. The symbol was not at the point intended to be the Factory logo, but as I mentioned, one of a set specifically designed for FAC 126. I did produce one other symbol a Christmas tree in the same style, which was used on a Factory Christmas card." Special thanks to Michael Stein for the scan.